RIDGEFIELD - It is impossible to remain seated during the wild ride that is the ACT production of Mamma Mia. With this premier performance by A Contemporary Theatre of Connecticut (ACT) under the energetic and enthusiastic direction of Daniel C. Levine, these singers, actors, and dancers create a happening. Stringing together the ballads and pop of the Swedish band Abba with a story line that provides mix-ups, mayhem, and emotionally charged moments, this popular musical tells the story of a young woman choosing her own path as her single mom finally finds love. Surrounded by friends and in search of family, Sophie (played by Emily Rogers) prepares for her wedding with her mom, Donna (Juliet Lambert Pratt). Donna has invited two old friends, Tanya and Rosie (Jodi Stevens and Sheri Sanders), to her Greek Island home. The intended bride has invited other old friends named Bill, Sam, and Harry (Craig Ramsay, Michael Hunsaker, Victor Hernandez). Sophie's fiancé, Sky (Paul Schwensen), is miffed and confused by Sophie's actions and ambitions. Peppy dance numbers abound in this happy-go-lucky piece. Choreographer Jason Wise has done a wonderful job of maximizing the potential of a small stage filled with dancers of varying skill sets. Playing dancing waiter Pepper, Alec Vargas sets the stage on fire with his physical prowess and seductive delivery. Tanya and Pepper rock the house with their rendition of "Does Your Mother Know?" All of the upbeat numbers set toes tapping, and singing could be heard in the audience during the performance attended for this review. Juliet Lambert Pratt's Donna sings back-to-back ballads "Slipping Through My Fingers" and "The Winner Takes it All" as if she was born to do so. She holds back not a single note as she belts out these two numbers from the depths of her soul. Her performance is endearing and moving. As Donna's two best friends, Jodi Stevens and Sheri Sanders are a riot. They are both terrific comic performers who find humor in their every circumstance. Their male counterparts - Victor Hernandez, Craig Ramsay and Michael Hunsaker - are equally as entertaining as they attempt to participate in the wedding festivities. Emily Rogers as Sophie and Paul Schwensen as her intended make a lovely couple with beautiful voices who can really hoof it. Theirs is a sweet and sincere romance. The entire ensemble is remarkable for its sheer energy and precision. They have obviously worked long and hard to make their performances look and sound so effortless. They create a beach party everyone wants to go to. Warning: you will be singing these songs and humming those tunes for days. The theater that is home to this new company is sleek in design and outfitted with top notch tech, lighting, and sound systems that were well applied to heighten the experience. Kudos and props to Katie Diamond and Daniel C. Levine for bringing this superb professional space to life with a musical no one could help but enjoy. ACT of CT is a magnificent addition to the rich tradition of theater in Ridgefield. While it would be worth it to make every effort to take in a performance of this inaugural production, each remaining show is listed as sold out on the company's website. The production has already been extended due to its popularity. For additional information and to find out what's next for ACT of CT, call 475-215-5433 or visit actofct.org. The theater is at 36 Old Quarry Road in Ridgefield. 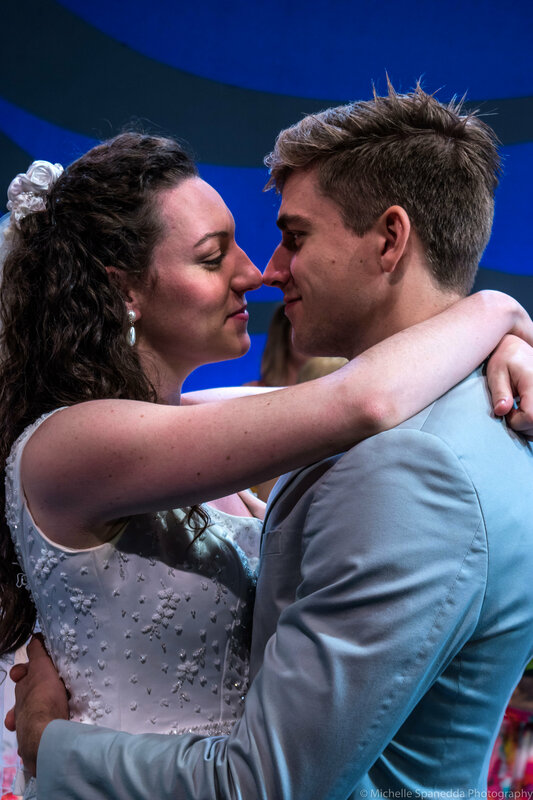 Sophie (Emily Rogers) and her fiancé Sky (Paul Schwensen) share a moment in a scene from ACT of CT's production of Mamma Mia!ÃÂ The first show of the new theater company in Ridgefield has not only been extended, but the additional performances are all playing to capacity audiences. 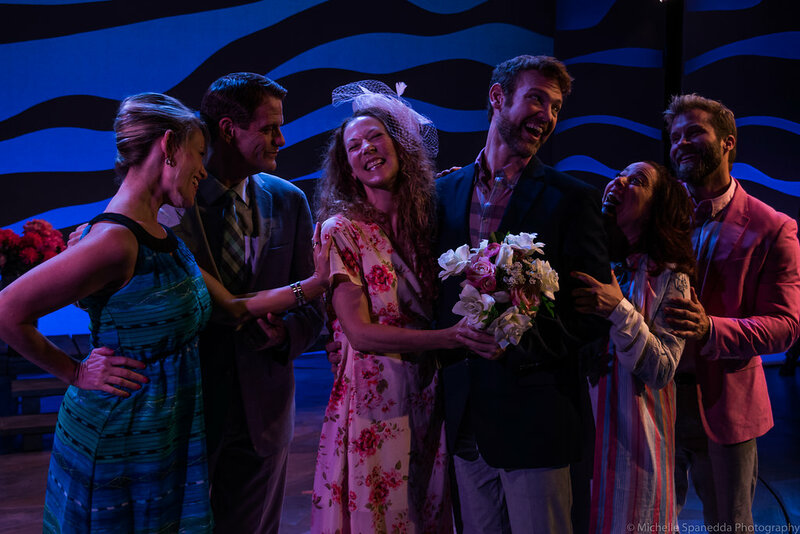 The mother of the bride, Tanya (Juliet Lambert Pratt, third from left), is joined by friends, from left Tanya (Jodie Stevens), Harry (Victor Hernandez), Sam (Michael Hunsaker), Rosie (Sheri Sanders) and Bill (Craig Ramsay) in a scene from Mamma Mia!, the outstanding inaugural production at A Contemporary Theatre of Connecticut.